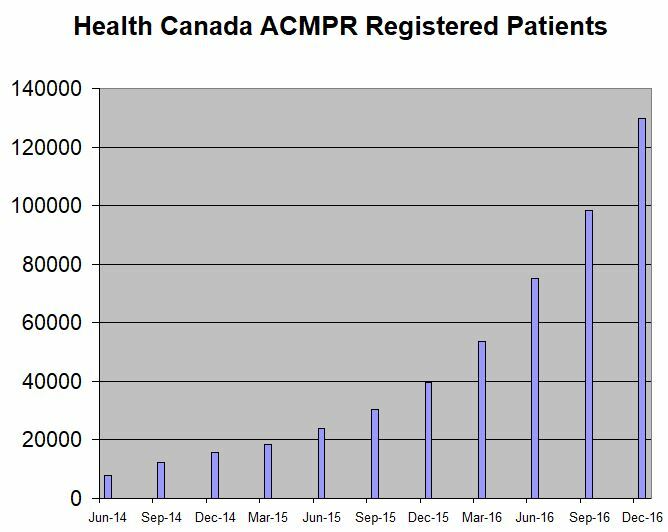 While Health Canada, which provided an update on April 24th, continues to get the official data out to the public very slowly, the patient enrollment growth in the ACMPR program at 12/31/16 was very strong. The number of patients enrolled in the program grew 31.9% from the prior quarter, adding over patients to reach 129,876. This represented growth of 227% from a year ago, a slight improvement from the 222% growth year-over-year in the quarter ending September 30th. Enrollment at the end of April is likely to be in excess of 180K assuming the monthly growth rate remains near 10%. Health Canada had suggested that by 2024 the patient enrollment could reach 425K, but this number, which is 1.2% of the population, is likely too conservative. My own projections remain achieving >500K patients by March 2020, which would still be below 2% of the entire population. I am assuming growth slows to 100% over the next year and then 50% in the year ending March 2019 and 25% in the year ending March 2020. This math suggests approximately 600K patients. Of course, overall consumption will likely rise substantially once sales are legal next year to adults for non-medicinal purposes. While the patient enrollment growth has been strong, the Health Canada data points to lower per capita consumption, which was 0.79 grams per day shipped on prescriptions, down from 0.89 in the prior quarter and from 1.12 a year ago. The popularity of cannabis oils was again demonstrated in the data, with unit sales reported at 4.109mm grams, which represented growth of 69.8% from the prior quarter. Dried flower unit sales grew 7.6% sequentially. Following the introduction of ACMPR, which replaced MMPR and allowed for limited home growing, Health Canada reported that there are now 2007 active registrations for personal and designated growing, including 1899 for personal production and 108 for production by a designated person.